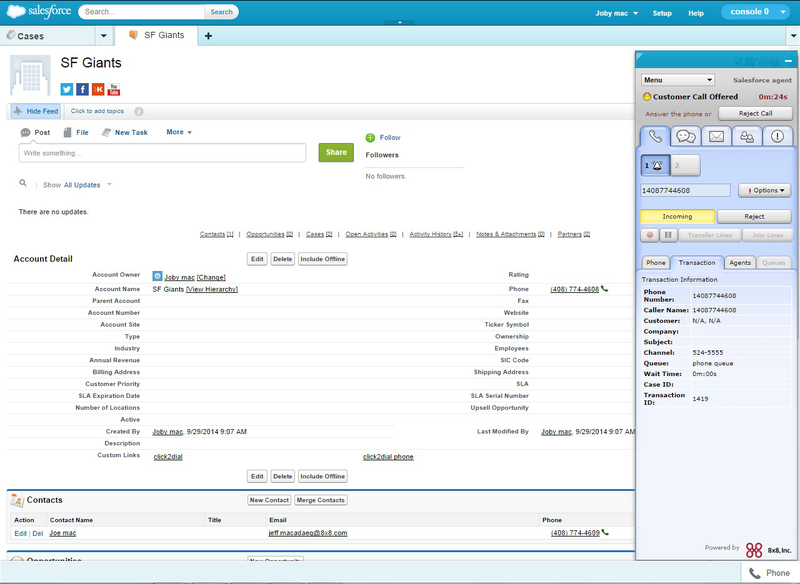 Virtual Contact Center now supports Open CTI Integration with support for Single Sign-On access from the native Salesforce environment. 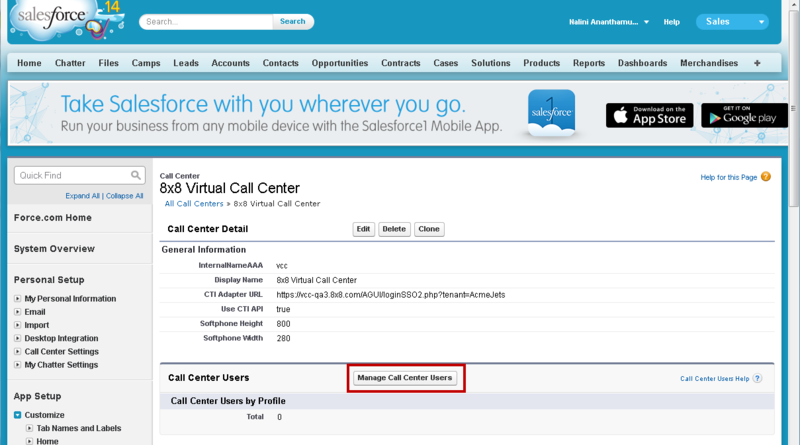 Salesforce users can launch 8x8 Virtual Contact Center app with just a click and reap the benefits of the integration. 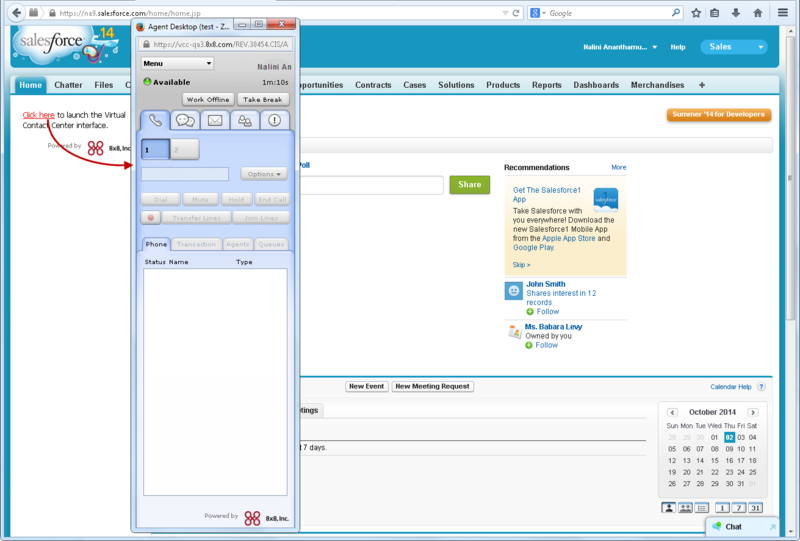 Ability to launch Virtual Contact Center from the comfort of Salesforce dashboard. Launch the following URL on your browser. 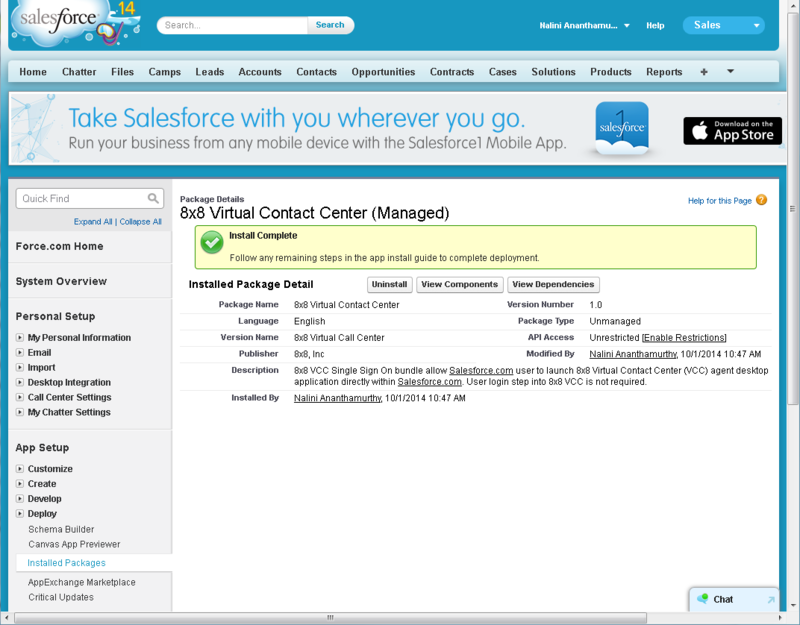 Note: You can get the Virtual Contact Center app from the Salesforce market in future. At the prompt, log in as the Salesforce administrator. 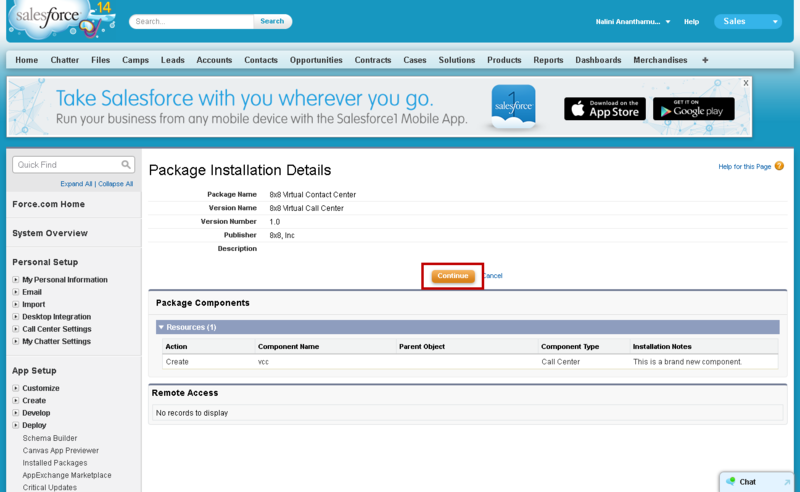 You will see the package installation details of the 8x8 Virtual Contact Center. Step 2: Install Package - Click Install. After successful install, you are notified that the installation is complete. In the left navigation menu, click Customize > Call Center > Call Centers. 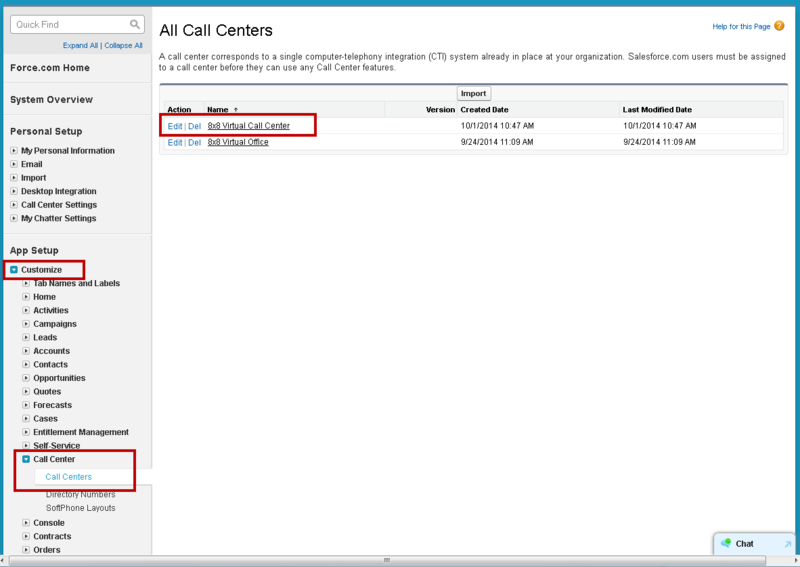 Displays the available call center packages installed. Click Edit next to 8x8 Virtual Call Center package. -naX is the VCC platform instance your tenant is hosted on. -yourtenantname is the tenant id of your tenant. Refer to the Platform URL Guide to get the cluster URL your tenant is hosted on. To allow users to use Service Console, you need to enable Service Cloud User in the agent profile. On Setup, Go to Administration Setup > Manager Users > Users. 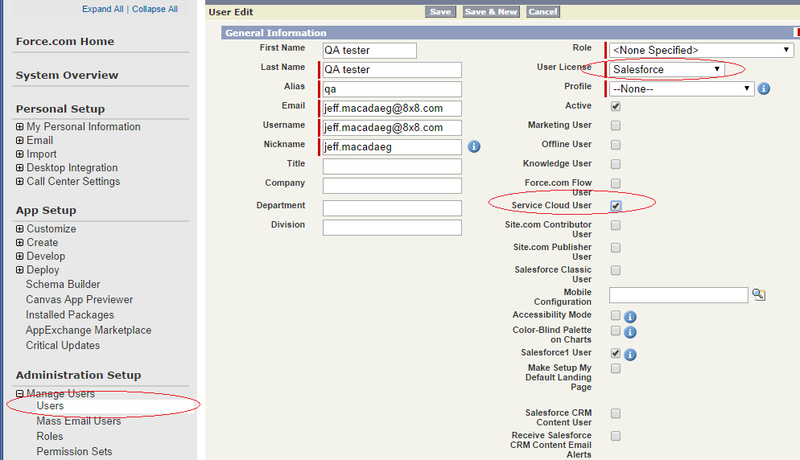 Edit the user and select User License to Salesforce, then enable Service Cloud User. 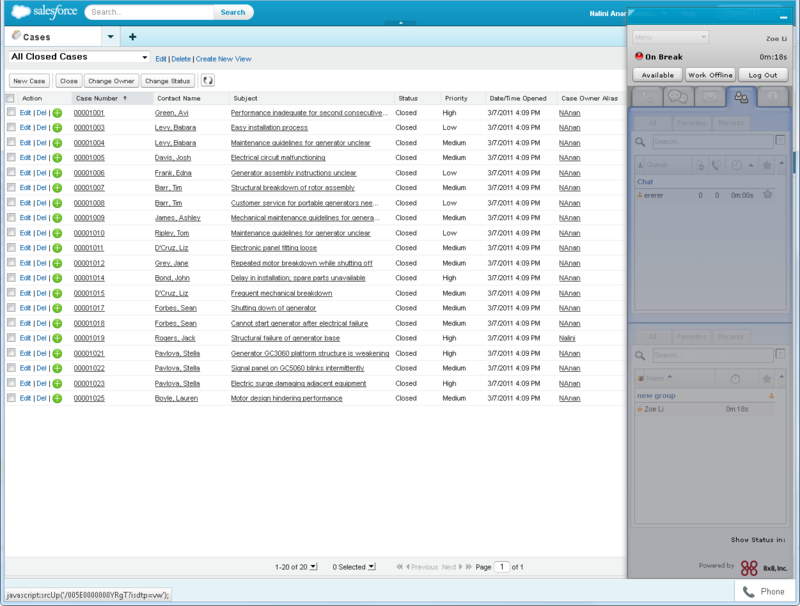 Log in to Configuration Manager and enable Salesforce integration. Go to Integration > Screen Pop tab. Select <Salesforce> for the Target Type. Select <Enhanced> for Integration type. 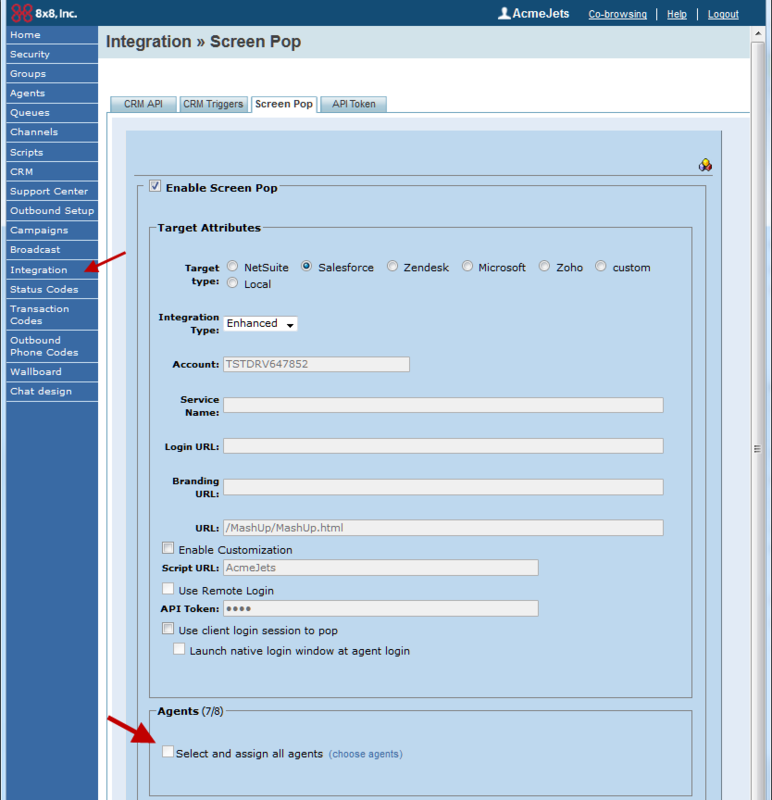 Select agents to provide access to Salesforce integration. Select media for auto log from Phone, Voicemail, and Chat. You can disable auto log for a specific medium by disabling it. Select the mode for screen pop of auto log from the available choices. For Window Properties of the Screen Pop, define the desired settings. This allows agents to define the size of the screen pop window and also set window properties. Note: The properties for Screen Pop window are applicable to non-console mode users only. 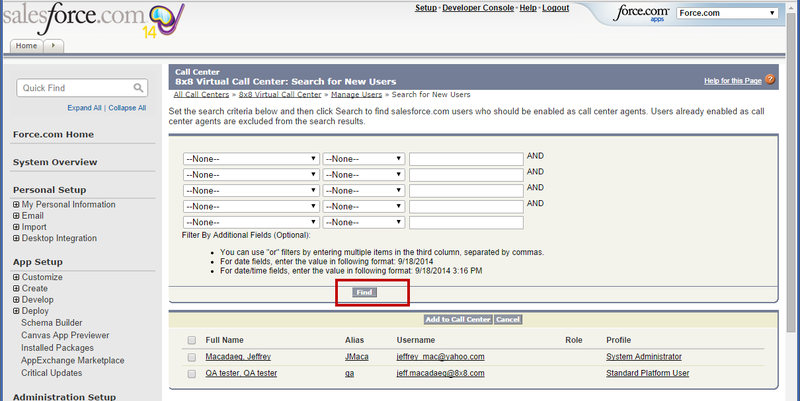 For details on these settings, refer to the Configuration Manager guide for Virtual Contact Center. 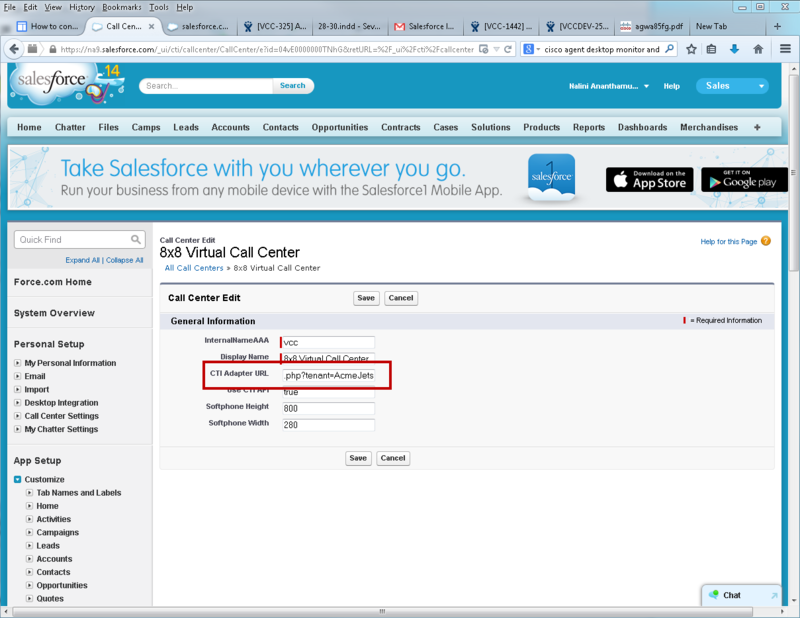 For Salesforce users to log in to 8x8 Virtual Call Center, you must ensure agent accounts in Virtual Contact Center are configured using the same email ID as the corresponding Salesforce user login. From the list, select the desired agent. Make sure the email address matches login ID of the corresponding Salesforce user. 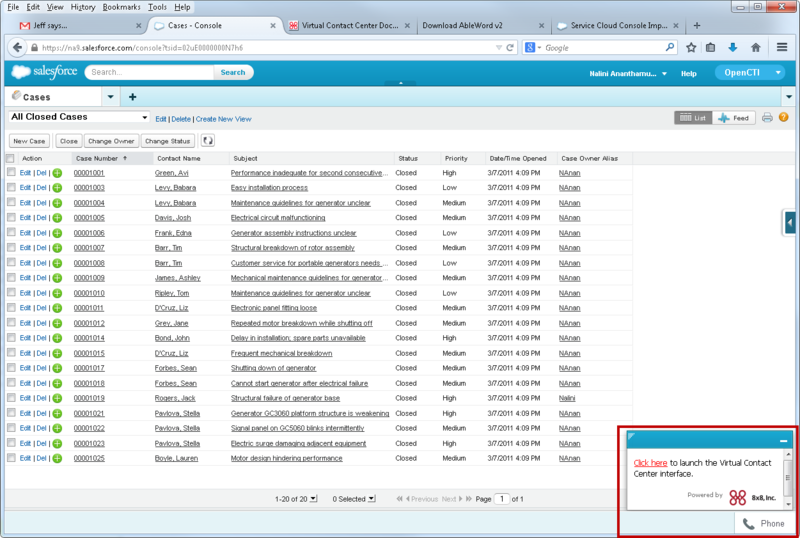 You have now completed the integration set up for 8x8 Virtual Contact Center. 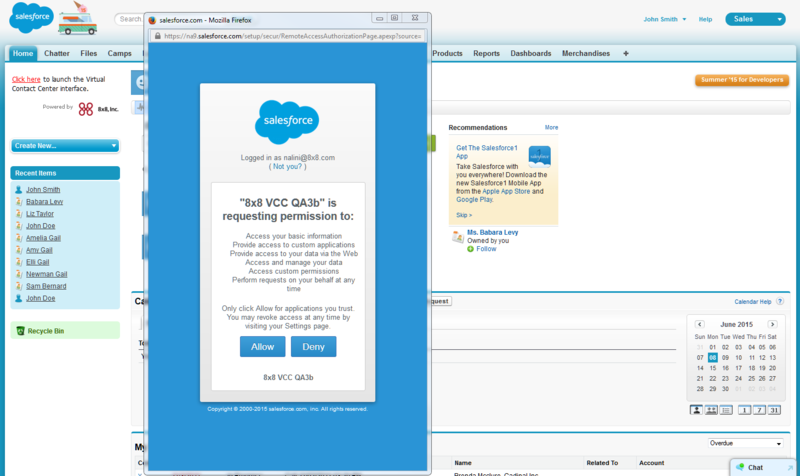 When first configuring VCC integration for Single Sign-on, the agent will need to give permission for the 8x8 app to interact with Salesforce. In order to give permission access to the 8x8 plugin, the agent will need to open the app from a Non-Console Salesforce page. If you wish to launch the app manually, you can disable the automatic login setting in the Agent Profile. The app behavior varies based on your Salesforce log in mode. If you are a Non-Console user, the app launches in a stand alone browser window. The screen pop occurs in a new browser session or refreshes the same browser session based on the screen pop settings by your administrator. 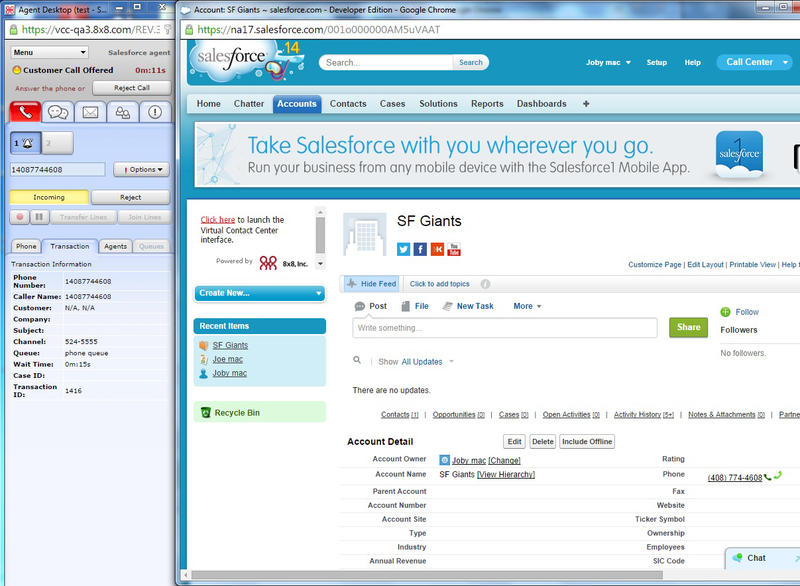 If you are a Console user, the app launches as a pop up window within the Salesforce login window. You can minimize it whenever needed. Log in to Salesforce in Non-Console mode. If your administrator has set up the integration with 8x8 Virtual Contact Center, you should see the link to Virtual Contact Center on your home page dashboard. Click the link to launch the app. Accept the app permissions at the prompt. You are logged in break status. You are not offered any interactions in break status. For details on agent status, refer to Agent Quick Start Guide. You are now ready to process your customer interactions using the Virtual Contact Center app. Log in to Salesforce account in Console mode. Switch to non console mode. Switch back to Console mode. Note: The app is a pop up window embedded in your Salesforce login window. You can minimize the app by clicking the minimize button.The interface looks as shown here. When you log into Salesforce, the app launches automatically by default. If you wish to launch it manually, you can disable the automatic login setting in the Agent Profile. Select Profile from Window menu in the Control Panel. 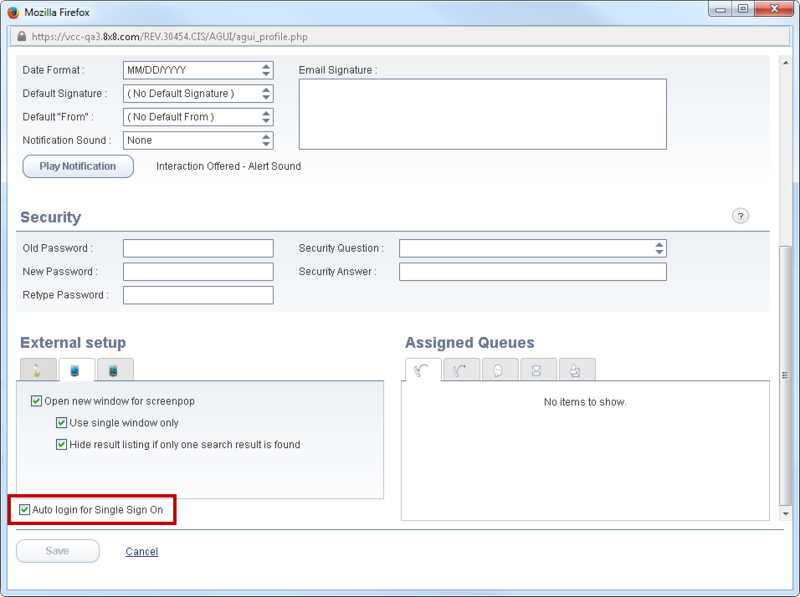 In the External Set up, un-check the option Auto Login for Single Sign on. In Console mode, click the Phone tab in the footer bar to bring the up the box with the trigger link. In non-console mode, click on the link to launch the app as shown below. Note: If you have multiple VCC agent accounts with same email addresses, the system looks up and links to the first agent found with the matching email address. In Service Console mode, the screen pop occurs in separate tabs within the dashboard. You can manage your interactions better in tabbed mode. In Non-Console mode, the screen pop occurs in a separate browser session. Each new screen pop shows either on a new browser session or refreshes the same browser window.